Natural beauty from the seashore! You may not have time to jet off to your favorite beach, so we’ve brought the best of the beach home to you. 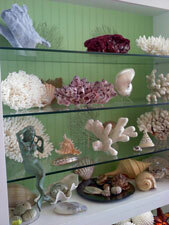 Our extensive Shells and Coral Collection is a magnificent group of coastal delights. 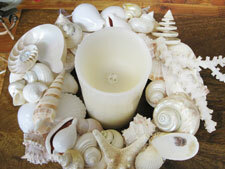 Every piece is natural, gathered from local and tropical beaches around the world. 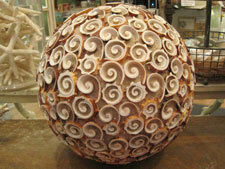 Perfect for centerpieces, as accents in powder rooms or on a coffee table, our selection is fabulous. 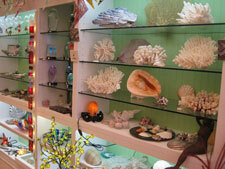 We carry starfish, large and small seashells, coral specimens, shell garlands and handmade shell wreaths. Our unique coastal lines featured in store are the handmade shell ball collection and our one-of-a-kind jeweled and encrusted starfish line, called “Sea Star Creations”. It’s impossible not to fall in love with a special treasure from the sea. Discover it at Candy’s Cottage!